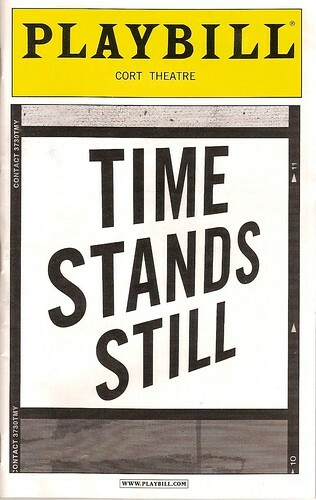 The last play PJ and I saw in New York was Donald Margulies’s Time Stands Still. Laura Linney plays Sarah Goodwin, a photojournalist that specialized in photographing war zones. Brian D’Arcy James plays James Dodd, a journalist and Sarah’s partner. At the beginning of the play, the two return to New York after Sarah has been gravely injured by a road-side bomb in Afghanistan. The play examines what happens to this couple in the subsequent months, especially as they see their old friend, Richard, played by Eric Bogosian, fall in love with and marry a much younger woman, Mandy, played by Christina Ricci. I really liked this play. All of the actors are excellent. Linney is great as Sarah, a career woman who knows what she wants but is also too smart for her own good — she’s fully aware of the consequences of getting what she wants. I really like that Sarah isn’t played for sympathy. Linney presents her forthrightly, warts and all. I could imagine that she and the playwright might be tempted to make Sarah more sympathetic, but they don’t. Instead, we see her choices and, at the end of the play, are left to judge for ourselves whether those choices are the “right” ones. The other three actors are also good, but none of the roles is particularly flashy. James is probably the most sympathetic character in the play; my only criticism of him is the play’s seeming attempt to critique him for wanting to study horror films instead of always witnessing the real horrors of the world. Bogosian and Ricci also good as the age-disparate couple who seem to really love one another. In many ways, the play presents all of these characters as the sum total of their positive and negative parts, their hopes and fears, their altruism and their selfishness. Each is fully conscious of the ethical and social dimensions of the life choices. I took them to be very realistic characters. They’re all smart, but they don’t allow their needs to analyze everything to cripple them from making choices. The play also explores what it means to be a professional woman today. Sarah has always put her career and her ideals first. She is confronted with Mandy, who chooses to put family before career and marries a man old enough to be her father. While Sarah wants to judge Mandy for these choices, the play doesn’t allow her to. Mandy isn’t an airhead, as Sarah would like her to be. When Sarah has the opportunity to make a similar choice, she has to figure out what’s right for her. The other issue that I thought the play did a great job with is the ethics of covering war, epidemics, starvation, etc. There’s a moment in which Sarah and James have to defend what they do: record atrocities and death without interfering or helping our their subjects. At first they argue that there’s nothing they could do to help except to publicize what’s happening, but then they are forced to question this assumption. Is it enough to record the horrors of the world? Or must we all do something more? Is there anything we really can do? Overall, this is a very smart, intellectual play that is also funny and entertaining. I very much enjoyed it. P.S. CBS news anchor Katie Couric was in the audience the night we saw this play. She tweeted her response to the play here.